Irving Pump Up The Fun 2018: Enter Your PIN At IrvingFun.com To Win! IrvingFun.com is the website you need to visit if you want to enter the Irving Pump Up The Fun Contest 2018, an annual promotion making fueling up at Irving gas stations fun and rewarding. Get your game ticket now through September 4, 2018 when you fuel up then visit irvingfun.com to enter PIN online for a chance win Irving Oil gift cards, free gas for a year or free gas for life. Are you ready to pump up the fun? 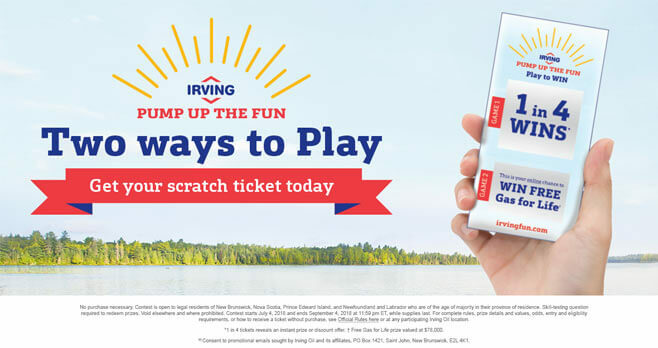 This summer, pick up your Pump Up The Fun game ticket by fueling up at any participating Irving Oil and Irving Big Stop locations. Some tickets may reveal a unique “PIN to Win” game code, an 8 digit alpha-numeric code needed to enter the Online Sweepstakes part of the Game. All you have to do is participate by entering your PINs at IrvingFun.com by following the instructions for your chance to win Irving Oil Gift Cards, Free Gas For A Year or Free Gas For Life. Participation into the Irving Pump Up The Fun Summer Giveaway 2018 is open to all legal residents of the Canadian provinces of NB, NS, PE, and NL who have reached the age of majority, as of Game Start Date, in the province in which they reside. The Game begins at 12:00:01 AM, ET or the start of business on July 4, 2018. The Game is scheduled to end in-store at 11:59:59 PM ET or the end of business on September 4, 2018 or whenever Game ticket supplies are exhausted, whichever occurs first. The names of the major prize winners are available through www.irvingfun.com or by sending a self-addressed, stamped envelope to “Pump Up The Fun, c/o P.O. Box 3009, M.I.P., Markham, ON L3R 6G4”. Sponsored by Irving Oil Marketing G.P. Administrated by WSP International Limited. For complete details, including Official Rules, visit www.irvingfun.com. I’ve tried for 3 nights to find a pin and can never get one? crap and a waste of time I’m sending back my card and go else ware for gas. I, like Nancy, cannot enter my PIN #’s in because when I put my email adderss in to log in..nothing happens.. If you can email some help, it would be appreciated. I also tried to enter my pins to no avail. How frustrating its is. I feel like we are being duped. Shame on you ! This is a confusing game! Mr Irving! You got to stop ripping people off! This got to be the worst trick ever!!!! Every few wins! Point at other service stations is a wonderful idea everyone wins. Your game is a ripoff. I have never had a more difficult time to get to where you enter pin #’s. Maybe this is what you want. Very frustrating and I noticed that a lot of other people had the same problem. My game cards pieces say that you can enter by Sept 11, 2017 but above it says Sept 5, 2017, which is it. I have tried for several days to enter this contest but have not been able to. Who is looking after this contest because they have not done a good job!!!! There I guess that doesn’t work either. but here is the collect-to -win number I have XL2113XM. The irvingfun.com page is in french. Where is the english page to enter pins? I have been trying periodly for 6 weeks to enter ” PIN numbers ” goes so far and that is it, can’t get to the place that takes the numbers! Had no trouble with this last year! Still trying tonight! Totally unable to sign up to enter a pin number. What’s going on??? I have tried over and over to get into the irvingfun.com to enter my pin # but it won’t let you in. I see other people are having the same problem. I always get my gas at the irving but if this is how people are treated will be buying gas elsewhere. Is this a scam. Much better system the old way. where do I put my pin number? Would love to win free gas for life! cannot enter my pin# – entered twice before – but now it takes you to an online survey? nothing to do with Irving – has someone hacked the site? No place to enter pin #. Is this just a ploy to get personal info through online survey? Enjoy the contest look forward to playing and to WIN! already signed in. just need to enter pin no., and can,t seem to get there. I have tried several times to enter my PIÑ # I can’t find where to put it. Just shows where to enter a sweepstake. I tried that but still no where to enter Pin# . This is nothing but a farce. .If you put out a contest for the public why should it be so complicated. make sure you are on the 2018 contest. The 2017 contest is still posted there. I would like to win free gas for life. why do they make it so difficult to enter a very simple contest. disgusted have been purchasing Irving Gas for over 42 years tomorrow I start with a new company. How do I put my Online Enteries on this site?? I agree with most comments above. You can’t get in to place your pin #.Have to do surveys and other crap,very dissappointed with Irvings! And now you tell me duplicate comments, I never responded ever before, so don’t give me that crap!you did it again!It doesn’t say anywhere that comments have to be good! You are losing a lot of customers! You people need to look fully when signing up … i had the same problem then i found i had to select you favorite location it is under the confirm password when you are signing up … once I did that and clicked the yellow sign up button it popped right up to enter your pin.